View More In Barrel & Hand Pumps. The Original Safety Siphon is a safe alternative to transferring dangerous fuels or messy liquids by other means. The hose with the patented self priming pump eliminates the risk of drawing hazardous or nasty fluids into your mouth when getting the siphon process started. Great for siphoning fuel into cars, boats, tractors, riding mowers, snow mobiles, snow blowers, ATV's, to name a few. It solves many draining water problems such as clogged sinks or commodes, aquariums, hot tubs, above ground pools, ponds, fountains, etc. Our premium hose is also FDA sanctioned for drinking water or to make home brews. 1. Before using, drain all liquid from the hose. 2. The end of tube must be lower than pump before siphoning will start. 3. Submerge pump into liquid that is to be siphoned. 4. Move pump vigorously in an up and down motion. It is important the pump remain in the liquid at all times to start the siphoning. Once the flow starts, stop moving or shaking the pump as gravity will maintain the flow of the liquid. Once siphoning starts, keep the pump submerged in liquid. 5. To stop siphoning, remove the pump from the liquid. 6. Drain all liquid from the hose and clean thoroughly. 7. Store in a cool, dry place. 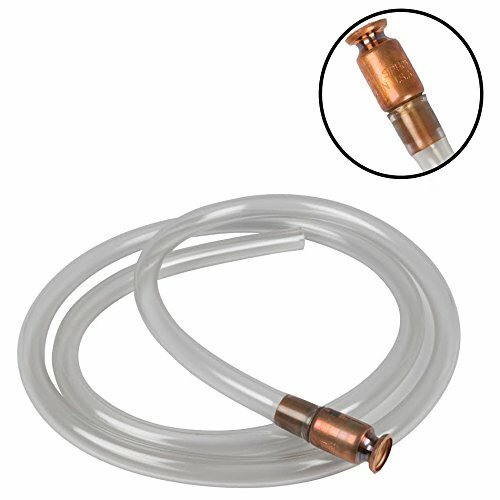 The 3/4" ID Premium 10' Siphon Offers Up To 6 Gallons Per Minute Flow Rate! If you have any questions about this product by The Original Safety Siphon, contact us by completing and submitting the form below. If you are looking for a specif part number, please include it with your message.